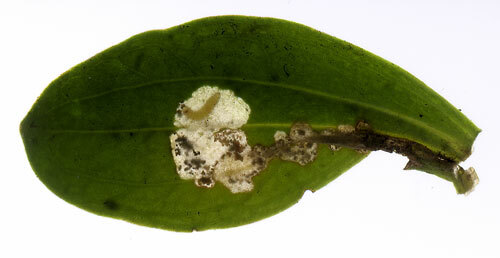 Full depth irregular blotch that may occupy an entire leaf. Frass in numerous, dispersed, brown grains. Some larvae remain in the mine until shortly before pupation, others leave the mine in an early stage and feed externally on the flower buds and developing fruits (Beirne, 1952a). Blackstonia perfoliata; Centaurium erythraea, littorale; Gentiana, Gentianella germanica. Larvae between May and September (Hering, 1957a); however the mine illustrated above, containing a living, young larva, was collected in early March. BE recorded (De Prins, 1998a, Phegea, 2008). From Sweden and Finland to the Iberian Peninsula, Sardinia, Sicily, Crete and Cyprus, and from the UK to Poland and Roumania (Fauna Europaea, 2008). Stenoptilia zophodactyla; Mimeseoptilus semicostata Zeller, 1873; Pterophorus loewii Zeller, 1847; Pt. canalis Walker, 1864. Baldizzone (2008a), Beirne (1952a), Bella (2007a), Bond (2001a), Embacher & Huemer (2008a), Gielis (1996a), Hart (2011a), Hering (1957a), Kuchlein & Donner (1993a), Kuchlein & de Vos (1999a), Nel (1996a), De Prins (1998a), Robbins (1991a).